Microspace Communications Corp. will distribute first-run films directly to Carmike movie theaters via digital broadcast from satellites. WASHINGTON -- The shiftto direct digital transmission of first-run movies from Hollywood to movietheaters across the country via satellite took a step forward when MicrospaceCommunications Corp., of Raleigh, N.C., reached a deal to distribute movies totheaters owned by Carmike Cinemas of Columbus, Ga., the nation's fourth-largesttheater chain. As part ofa pilot program, Microspace will install satellite and server equipment inmore than 200 Carmike theaters, making it possible for digital satellitetransmissions to reach more than 2,000 screens, Microspace officials said.Neither Carmike nor Microspace would divulge the cost of the agreement. The deal, reachedon March 7, will enable Carmike, already the biggest user of digital technologyin the movie theater business, to accept films from more Hollywood studios.Carmike entered the deal with Microspace because some studios have preferencesas to which satellite delivery company they use, said Tony Reed, senior vicepresident at Carmike. 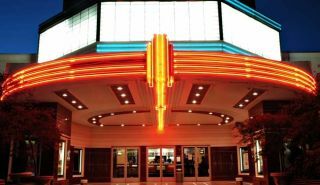 Carmike hashad a deal in place with Access IT of Morristown, N.J., since March 2004, toreceive digital transmissions of movies directly via satellite. OfCarmike's 2,447 total screens in 289 theaters, 1,711 screens in 85 theaters areset up for digital, Reed said. "Access IT,to date, has delivered films to Carmike theaters from Buena Vista, Universaland a couple of others," he said. Microspaceexecutives say their company has delivered 10 first-run films -- "Glory Road,""World Trade Center," "Dream Girls," "Over the Hedge," "MissionImpossible III," "Eight Below," "The Shaggy Dog," "She's the Man," "FlushedAway" and "Cars" -- to eight theater chains across the country. The moviesplayed on more than 2,000 screens at some 250 locations, said Curt Tilly,manager of digital cinema distribution for Microspace. Usingsatellites to deliver films to movie houses enables all parties involved --studios, distributors and cinema chains -- to handle complete, virtuallypristine versions of films without having to rely on overland deliveryservices. Because the films are transmitted directly into servers at eachcinema via rooftop satellite dishes, chains do not have to rely upon staff tobe on hand to receive and upload films. "Frankly,when theater owners and studios say we're the next generation trucking company,we don't think of ourselves in that way," said Joe Amor, Microspace's vicepresident and general manager. "But in the movie industry model, yes, we are." "With asatellite, you deliver directly into the theater's server," said ChuckGoldwater, media services group president for Access IT. The practicalitymanifested itself when a recent spate of bad weather hindered film delivery inmuch of the country's northern tier, he said. "Wedelivered some films that were supposed to be delivered via hard-drive butdidn't make it to theaters," Goldwater said. Whilesatellite companies like Microspace and Access IT believe their service shouldultimately become the industry standard, there is a long way to go. Of the38,500 movie screens in the United States, only 2,300 are digital, according tothe National Association of Theater Owners, a Washington-based tradeorganization. More work needs to be done before satellite transmission becomesthe industry standard, said John Fithian, the association's president. "Theindustry -- cinema companies, studios and equipment manufacturers -- are workingto come up with technical standards and business models," Fithian said. One problemthat had hindered the spread of satellite transmissions -- the high cost ofequipment -- has been resolved, Fithian said, at least in North America. "Fees[for new equipment] are paid by the studios." The futurelargely will be determined when a group made up of the three largest cinemacompanies and two major Hollywood studios decide which platform fordistribution they will use, Fithian said. "The moviechains -- Regal, AMC and Cinemark along with Warner Brothers and Universal --are still exploring what the [digital] distribution platform should be:satellite, broadband, disc or tape," Fithian said. "Those three companiesrepresent 14,000 screens. "Mostobservers believe that satellite transmission will play an important role, butbecause it's in the early stages of rollout, those distribution factors haven'tbeen decided yet," Fithian said. In thecontext of Carmike's deal with Microspace, he is taking a wait-and-seeapproach. "TheMicrospace deal is still only a pilot program for satellite delivery," Reedsaid. "If everyone is satisfied [after Dec. 31 when the pilot agreement ends],then we'll do a real contract."